Medallion cornice; bracketed door hood on top of good Federal doorway. This property was once owned by Thomas C. Foster who sold a two acre lot to Enoch Abbott Jr., house-wright, on Dec. 6, 1831. Enoch Abbott was born on Nov. 7, 1804, son of Enoch & Nancy (Flint) Abbott. Enoch married Roxanna Tyler b. 1810. The 1850 Andover Valuation Schedule lists Enoch Abbot Dwelling house $1000.,Barn and slaughter house $500., 1 3/4 acre adjoining buildings $200. 9 Sutton plain $108., 1 acre Tare Coat, $100., Personal estate; Horses & wagons $240. Enoch & Roxanna had five children: George Thomas b. 1850, Frank K., Charlotte, Mary T. Charles A. Abbott. Roxanna died on Jan. 12, 1871 and Enoch sells the homestead to son George T. for $3500 on Nov. 17, 1876. George's siblings quit claimed the deed to him in 1881. Enoch Abbott Jr. died on Feb. 28, 1891 at age 86. He is interred at South Parish Cemetery. George T. Abbott married Alice Raynor b. 1852 daughter of Thomas & Elizabeth Raynor. George transferred the deed to Alice on Aug. 16, 1884. It is not known at what time the cottage house was built to the rear of the Abbott lot but a barn occupies that location on a 1884 map. George T. & Alice R. Abbott both hold the deed on Jan. 9, 1928. George died on July 1, 1930 and the estate was inherited by Alice. 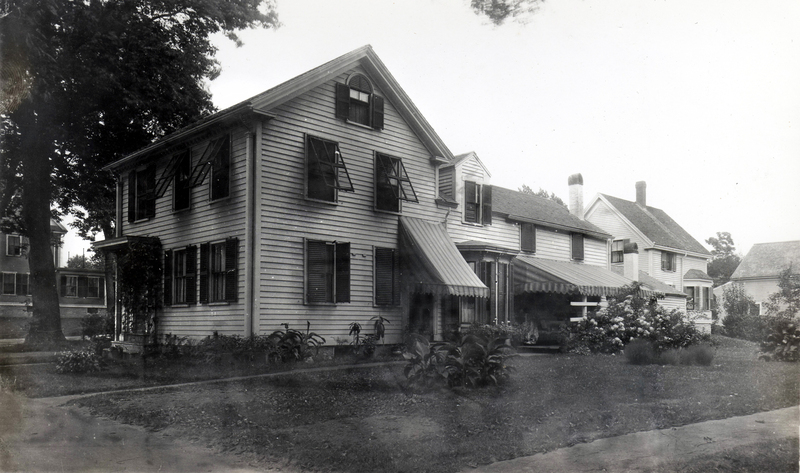 Alice sold off the cottage to Catherine McMahon on Feb. 7, 1935 with a right of way to the home. Alice died on Mar. 4, 1935 and the property went to Susan Kerry on Oct. 10, 1936. Keery then sold to Michael J. O'Connor and Dorothy I. McDonough on June 27, 1942. Dorothy married Ernest J. Rivers and Michael married Isabel. The property was then sold to Michael J. & Isabel O'Connor on Nov. 29, 1948. Michale O'Connor died on Aug. 24, 1952 and Isabel inherited the property. Isabel remained for three years then selling to John J. & Isabel M. Quill on Oct. 18, 1955. 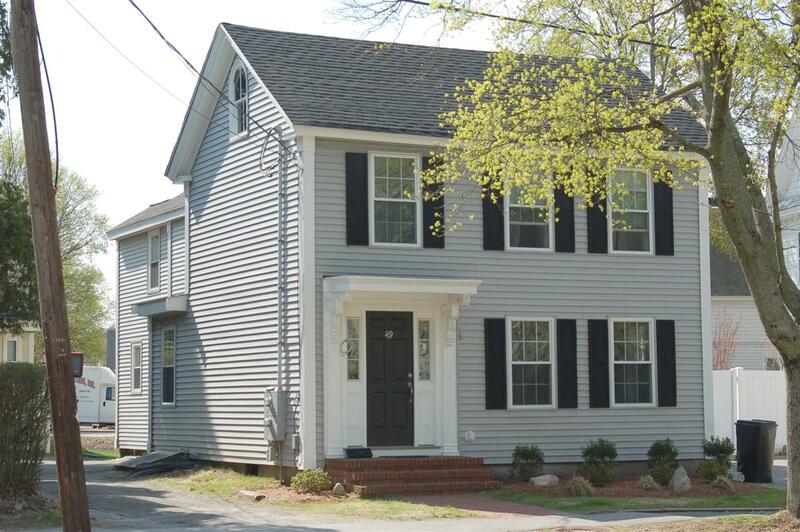 R & Y Realty Co. Inc. of Brookline, MA purchased the property on July 2, 1957 and owned for 15 years. Linda Cole purchased the home on Dec. 29, 1972 and sold the following year to Regina Correia Branco in June 1973. Branco owned for 10 years then selling to Michael M. Kaleel in 1983. Kaleel had also purchased the cottage house at 47 1/2 (47R) Elm the month before. Both were income properties. Kaleel sold both properties on 1997, this one purchased by William C. Cotter Jr. on Jan. 9, 1997. Cotter completely renovated the home about 2010 converting it to a two- family house. Much of the exterior wood clapboards and all windows were replaced by the current materials. The arched attic windows remain original to the house as does the front door surround. Acreage 0.175 acre; 7,669 sq. ft.; approx. frontage 66 ft.